When it comes to our horrendous fiscal deficit, there are many who still maintain we can afford to wait before starting on retrenchment. Yesterday's rather nasty public borrowing statistics underline just how dangerous that argument is. Because once you strip out the effects of the various financial sector support operations - which the government has always insisted are temporary - then borrowing in the first 3 months of the current financial year was actually higher than that in the same period last year. And that despite the fact that the economy almost certainly grew during the intervening period (we'll get the official GDP update on Friday). And despite the fact that public sector investment spending was squeezed down. What happened was that although tax revenues increased by £8bn - boosted by a £4bn jump in receipts from the higher rate of VAT - all of that increase was used up covering a 6% increase in current spending. 6%? Can they be serious? Here in the midst of Austerity Britain, HMG has somehow allowed its current spending to shoot up by 6%? What on earth are they doing? For sure, some of it is accounted for by an increase in the welfare bill, as might be expected with higher unemployment. But when we scrutinise the figures, we find that only acounts for 1% of the 6% overall increase. The rest? Well, spending on goods and services (staff and procurement) rose by 3%. Which is somewhat alarming, given all the talk of budgets being pared to the bone. But the biggest contributor - by far - was the explosive growth of debt interest payments. The ONS says the cost of central government's debt interest grew by an alarming 54%, acoounting for half the overall increase in current spending. 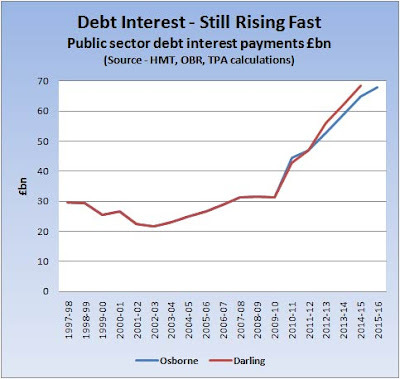 We've blogged the looming debt interest crisis many times (start here). But let's just remind ourselves of the key point - the longer we go on running these horrific deficits, the worse it's going to get. Our outstanding debt will increase, and there is always that risk that the markets will take fright and rack up the interest rate they demand from HMG. 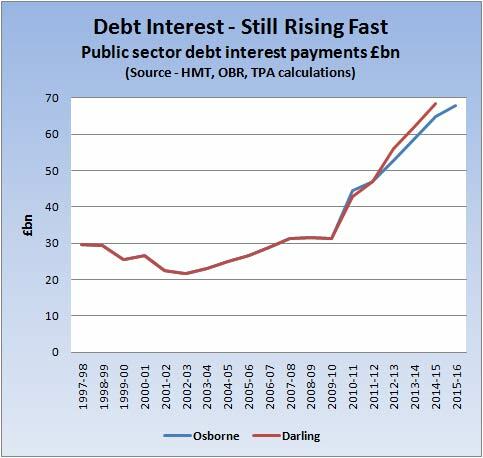 And even though Mr Osborne has announced tighter targets for public spending than Mr Darling's, the debt interest bill is set to spiral anyway. So next time you hear that we can afford to wait before facing reality, remember this. Remember that the debt interest bill is already sending shockwaves through the public sector accounts, and that we taxpayers are picking up an ever larger tab.